There will always be dangers in any team sport, particularly one that involves contact and speed as hockey always does. The prospect of an injury is never a matter of if, but when. In recent years, both football and hockey have suffered somewhat of a black eye for their treatment of concussions. Both the NFL and NHL have been on the wrong side of several lawsuits from former players who now deal with the very real effects of multiple concussions and even traumatic brain injuries. Football was the first of the two to take fire on the issue, and one would have thought that the NHL and Commissioner Gary Bettman would have at least learned something from the NFL’s mistakes. Certainly, some steps have been taken, but it’s clear that there is still a long way to go. The NHL is following blindly down the same path as the NFL as they continue to plummet further down the rabbit hole with instances of blatant disregard for the safety of its players. In the last several months we’ve seen Chicago Blackhawks netminder Corey Crawford take a direct hit to the face with a blistering slap shot. Crawford and the team trainer did a quick on ice assessment (sarcastic air quotes and eye rolls required) and decided he was fine to continue. Play was never delayed, backup Scott Darling was never told to get ready, and no medical professional beyond the trainer ever saw Crawford before play was allowed to resume. The officials on the ice had to have felt some concern having witnessed the event from ice level, and certainly, the elusive concussion spotters nearly fell from their perches ready to swoop in and prove that they do exist. Crawford was never evaluated by the alleged concussion spotters. Either they are getting minimum wage, or the league should be asking for a refund because no part of that situation was okay. The word concussion never came up after the game, but Crawford did miss his next start and came back not quite the same in his first start back, in fact many felt he was not quite himself for some time afterwards. This was a huge fail on the part of the spotters, and the team’s physicians, but an even bigger one by the league who claims to be working diligently to protect the players. Spoiler alert, you aren’t even protecting yourselves when you do NOTHING! Even more recently, there was a pair of events in the Penguins second-round series against the Washington Capitals. First, Sidney Crosby was absolutely brutalized with a pair of head shots in rapid succession, one was perhaps more deliberate (which is not to say Alex Ovechkin intended to cause a head injury, but it was certainly avoidable) than the other which appeared more inadvertent. Crosby was clearly injured and play stopped immediately. He was removed from the game, and it quickly began circulating that it was, in fact, a concussion. Clearly, with Crosby’s long history of concussions he would be out for a significant stretch. Fans were in a panic, as the team was in the middle of a playoff run to defend their Stanley Cup title. Of course, they didn’t have long to despair over Crosby as a short time later, Conor Sheary got clipped in what can only be described as friendly fire. He collided with a teammate and also took a direct hit to the head. The Pens didn’t make it one period without incident, let alone one day. Sheary was also removed from the game with a concussion as well. While he didn’t get the same headlines, at this early stage of his career the injury is no less significant. With both players diagnosed with concussions, and the team confirming that diagnosis, the team, and the league would have no choice but to rest both players and take great care to see that they are 100% before they are allowed to resume skating let alone take contact. Especially while playing against one of the league’s most physical combatants in an already heated second round battle. Surely, they would be out at least a week maybe ten days minimum. It would be a tough loss, but a sacrifice that would have to be made for the players well being and for their future as no one can play this game forever. Right? We are talking about a league that makes all decisions based on money and ratings, so let’s be real. Crosby is a cash cow, and he delivers ratings so it is in the NHL’s interests to have him on the ice. Especially in the heavyweight matchup that pits him against Ovechkin. What about the concussion spotters that are supposedly in the stands every night you might be asking? Does anybody still believes in fairy tales? So far this season, I have seen one instance that appeared to be the removal of a player on the behest of a concussion spotter. They are so elusive that even the late Crocodile Hunter would have had a tough time finding them. With the league concussion protocols being about as exact as the release date for the next two Avatar movies, NHL fans went on Crosby/Sheary watch. If you had two days in the office pool, ding, ding, ding, ding, ding. We have a winner! Both Crosby and Sheary skated just two days later (less than 48 hours) and were apparently given baseline concussion testing that deemed them both ready. They each were ruled game time decisions, but as soon as word got out they’d skated, we all knew they would play. The reality is, that as long as a player can take hits like Crosby did and still play it will be tough to convince anyone that the league is doing anything to keep the players who put themselves at risk every night safe. The same players that create the league’s revenue. For both players to have passed these so-called baseline tests, they must be fairly basic. Perhaps they went something like this? Medical Staff: How many fingers am I holding up? Medical Staff: Sounds good, we’ll split the difference. The trainer then turns to Mike Sullivan and all of the very concerned Penguins powers that be with the high sign. Seriously, who created a baseline concussion test that lets two players get into a very physical series after those kinds of hits? I suppose we should feel good about the fact that they even pulled the players from the game in the first place after the Crawford misstep, but honestly, it is no more alarming. A marquee player and a young forward with a ton of potential very well could have added another link to the chain that will sink their careers early because of concussion issues. What’s worse is that anyone who is a fan of hockey (not the fools who only come to watch bone crushing hits and fights) holds their breath every single time Crosby or Sheary hits the ice. It’s not like the Capitals had a team meeting ahead of the game calling for them to go easy. Barry Trotz: Okay, now everyone knows that Sheary and Crosby will be back tonight, so be careful and try not to touch them or make contact with their heads. In fact, after watching Crosby in the two games since he’s triumphantly returned with a note from his team saying, ‘please let Sidney join the reindeer games tonight’ it quickly became clear that the Capitals were planning to buzz the tower early and often. Crosby is the biggest thorn in the Capitals side, and if they can take him off of his game with some heavy contact or even take him out of the game they will do whatever it takes. I’m not even talking about cheap shots (pretend if you like but every team is guilty of cheap shots). Crosby could catch an edge and take himself out of the game inadvertently, or he could go out because an errant stick that catches him in the face. Oh wait, that happened. He went to the pit crew for repairs but stayed in the game. Surely, when he took an awkward head-first slide into home plate…I mean the boards, he would be done. Anyone would be, right? If you are a fan of the sport, and this looks like a non-issue to you then I have only one question. Were you dropped on your head a lot as a child? There is absolutely no way that Crosby should not have been at the very least evaluated after this, but he was right back out there. Sure, there are many fans thankful that their captain is still on the ice, but when he retires those same fans will move onto the next big thing to land with the Pens and might only give the cursory, “Awe, that’s really too bad” when they read about Crosby or another player dealing with the very real long-term ramifications that ride shotgun with head injuries. Especially when they go untreated. Of course, there are these fans who wish everyone would just stop talking about it, and that we’d all stop playing doctor and diagnosing Crosby, or Sheary, or Crawford for that matter. God forbid the Penguins are forced to play without their best player because that is the most important thing. The truth is, if the league, teams, concussion spotters, and medical staffs did their jobs there would be no peanut gallery diagnosis needed. There is no easy fix in this situation. As with any other issue regarding player safety, there has to be a set of guidelines that every team must follow, and in the case of head injuries an unaligned set of eyes making the final call. Consider the officials, they don’t oversee the same team all year, they rotate. A similar scenario would have to be set up for those in place to assess concussions. Fifteen to 20 (perhaps more) sets of eyes that each travel and assess the two teams as they face off on a given night. Sure, there will be some nights they are paid spectators, but in the event of a head injury, they could be invaluable not only to the players and teams but the league as well. It removes the emotional part of decision making when the assessment is made by someone who doesn’t have any attachments to the team or the player. Who deserves the most blame? The doctor for clearing him? The concussion spotters? Coach Sullivan for playing him? This is Crosby's LIFE! This can’t be running on the team’s agenda, as spending day after day with the players too often creates emotional and almost familial attachments to the team and the players which rarely leads to objective decision making. The Penguins staff don’t want the team to be at a disadvantage without Crosby, nor do they want to see Crosby injured, or upset the player or coaching staff. It’s an impossible situation because whatever call they are forced to make is unlikely to make everyone happy. Using the other team’s medical staff doesn’t work either. The difficulty is that even the league’s concussion spotters might be less inclined to force a marquee player out of a playoff game, so there has to be a set of parameters that eliminates the emotional or financial aspects of the decision making process. 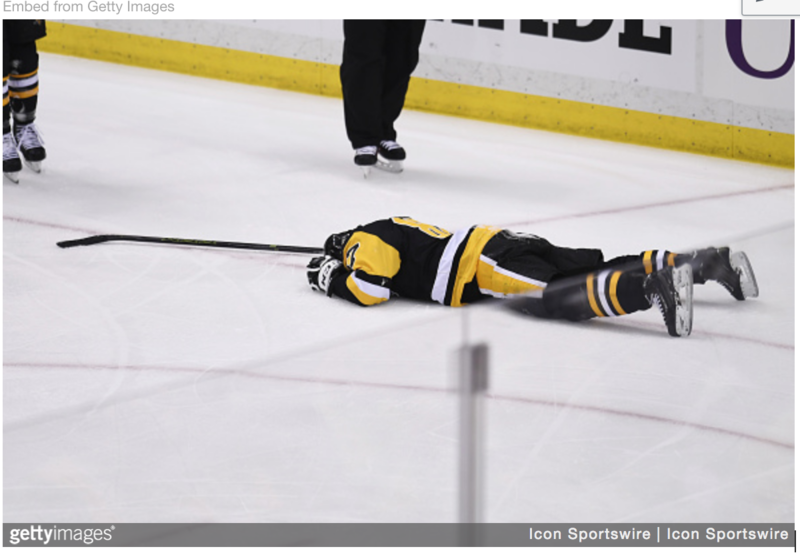 A hit to the head where the player is unable to get to his feet on his own, loses consciousness, or displays clear cut concussion symptoms should not be allowed to set foot on the ice for 7-10 days, even if they say they are feeling fine. In addition, a crash to the boards like the one Crosby suffered last night should be treated as a potential head injury. If it is the second instance as is the case for Crosby (though he returned way too early in the first instance), that time frame should doubled. Once that time frame has been met, an outside medical professional not associated with the team should re-assess the player and rule that they may resume skating and provide a time frame for contact unless they deem further evaluation is necessary. All paperwork should be filed with the league as well as the team, and fines levied on all parties (teams and players) should the mandates not be followed to the letter. All fines collected should go to a fund such as the Concussion Legacy Foundation or Chapter 5 Foundation. These decisions should never be made by team physicians, coaches, or training staff as the instances of upper body injuries would likely go through the roof knowing that a 7-10 day hiatus was all but guaranteed. We all know just how much the league loves its vague injury descriptions, and in most cases that is perfectly fine, but head injuries are another story. The issue was made even clearer as a reporter asked Crosby about a concussion evaluation after his collision into the boards last night, Crosby and coach Mike Sullivan weren’t even reading the same book, let alone the same page. Players want to play, and they certainly don’t want to let their teammates and coaches down. Too often, they are willing to do whatever it takes to get back on the ice no matter the risk and ordinarily that’s maybe even commendable but let’s be real for a second. This isn’t a broken finger or a torn muscle. A head injury can greatly impact a player long after his skates are hung up for the last time. This is a matter of that player’s future and their quality of life. That might not seem important when they’re 28, but at some point down the road, it’s going to matter. Unfortunately, they’ll never know how much. We don’t have a crystal ball but what we do have is history. The NHL has a long list of players who are currently suffering the after effects of too many concussions and traumatic brain injuries. The NFL does too. Players battling depression, emotional outbursts, self-medicating, alcoholism. That is just a small sampling of issues that former hockey and football players have suffered. Even more alarming are the instances of suicide, violent behavior towards others, diminished motor skills, dementia, tremors, chronic traumatic encephalopathy (CTE), and a host of other debilitating physical and emotional issues. The league’s insistence that this is not a problem they need to be concerned with even rubs off on fans. Well here’s your wake up call everyone. Crosby is back and you better get to celebrating, because every time your favorite player is allowed to play with a head injury is time that will be stolen from his career in the long run. If by some stroke of luck they have a long career, then you better start preparing yourself for the stories of their post-concussion syndrome in ten years, or how their life was cut short in a battle with the long-term ramifications of head injuries. Will it still be worth it when that star player is wheeled onto the ice for some ceremony or shown on the big screen with noticeable tremors before their hair turns gray? For those that just want their star player in the game, you are partly to blame. In doing so, you are aiding and abetting a league that puts profits over players and it will never stop until the conversation becomes so loud that the league has no choice but to respond. The outrage is all over, with just about everyone in agreement that the current system has more holes than a sieve. The league needs to stop focusing on the excitement of the game and start worrying about the health and well-being of their players while they’re playing and long after they are gone. For more info on the impact of concussions and what you can do to help please check out The Concussion Legacy Foundation or former NHL player Daniel Carcillo‘s Chapter 5 Foundation started to aid players whose careers have been cut short by injury and in the memory of a fallen teammate Steve Montador. You can read more about Carcillo’s journey and what led to the creation of Chapter 5 here. Or seek out a concussion program in your area. This is a very real concern that is being taken seriously in kids programs across the nation and the NHL is falling behind. If you love the sport of hockey, have a child who is a hockey player, or if you are just a casual fan this issue matters. Head injuries are a part of the game, but how we treat them should have nothing to do with the game and everything to do with the players future in mind. No one game is important enough to risk any players future.